Today’s Washington tour guide for out-of-town Winter Classic attendees takes us to the newest up-and-coming neighborhood to up and come. H Street NE spans about 13 blocks, from just north of Union Station to around 15th Street and the old Hechinger Mall. 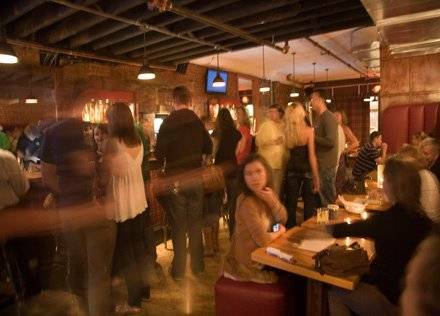 Once dreary and down on it’s heels, H Street NE these days is home to thriving night life, great food and drink, and tons of younger scene-sters with funny mustaches and ridiculous skinny jeans. It’s also one of the few places left in town where rents are affordable enough for bars and restaurants to take some chances. Today’s tour guide is Dave Eskola, a DC transplant by way of Duluth and hockey fan extraordinaire. Dave was smart enough to buy a house just off H Street several years ago before it exploded, banking that it was going to be DC’s hot-hot-hot spot. 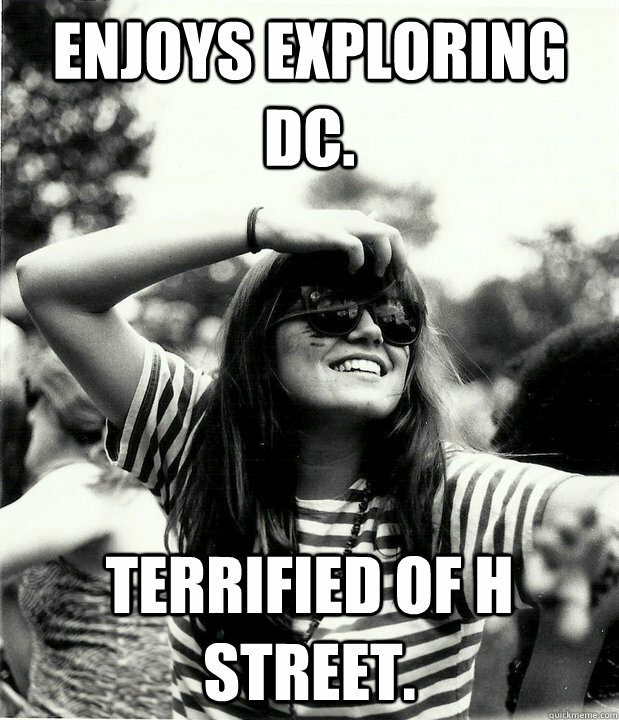 The H Street Corridor,a.k.a. 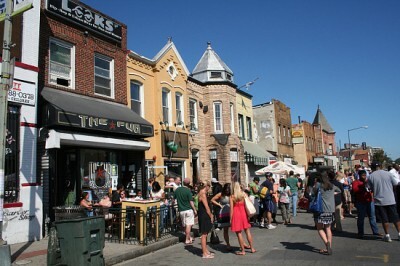 Atlas District, is a symbol of DC’s renewal as a place to live and live life, not just to work. A center of African-American commerce and nightlife through the 1950s (Charlie Parker recorded the famed live LP “One Night in Washington” at the long-gone Kavakos Nightclub at 727 H NE in 1953) – much of the strip burned during riots in 1968. It was largely derelict until the high housing prices and the prospect of shorter commutes started luring Yuppies into the neighborhood in the mid-00s. This displaced some long-time residents – and made other long-time residents wealthy. Bars and restaurants followed. Former Mayor Adrian Fenty tried to goose development and tourism and improve transportation with the addition of streetcar tracks during road reconstruction five years ago. Haphazardly planned and long delayed, the trolley may start taking passengers this month. Rides reportedly will be free for awhile. Bars and restaurants mentioned here can be accessed by the streetcar, which runs from the Hopscotch Bridge on H Street in the rear of Union Station (exit out the back toward the parking garage) to the Minnesota Avenue Metro station on the Blue/Orange line across the Anacostia River. The X2 bus – known locally as “The Extreeeeeme!”—also runs down H between the White House and the Minnesota Avenue station. The second busiest bus route in DC, it can be an adventure. Not a whole lot of interest in terms of dining between 7th and 10th yet. At 8th and H, two major bus lines intersect and in addition to waiting passengers the corners can also be a magnet for boozy loiterers. Ethiopic; 401 H St NE: DC’s known for Ethiopian cuisine and Ethiopic is one of the better examples. It’s small but has well-prepared food and good options for vegetarians. Has drawn well since opening and has a dedicated following. Owners have one of the relatively few bakeries in town next door. Boundary Road; 414 H St NE: Craft cocktails, hipster vibe and some ambitious and generally good dishes. President and Michelle Obama dined here shortly after it opened in 2012, turning it into a hot destination that continues. Worthwhile late night happy hour, have encountered bartenders with ‘tude. Le Grenier; 502 H St NE: French bistro with good food and happy hour. Cool vibe with 60s-70s French pop on the soundtrack, clever use of lighting. Tasty mix-‘n’-match meat and cheese plates. Decent brunch. DC Harvest; 517 H St NE: New American newcomer to the west end of the corridor is a small but atmospheric space with great drinks, an ambitious menu and earnest service. The premise is the farm-to-table experience. Food is generally good but can be hit or miss and some complain about small portions. Great bet is fried chicken nights Monday and Tuesday, delicious food and a good value if you order it with the drink special. Liberty Tree; 1016 H St NE: One of the first sit-down places on the “new” H Street is still one of the better ones. Best bets are the clam pizza and the lobster mac and cheese. Cozy bar. Atlas Room; 1015 H St NE: Often mentioned as the best fancy-schmancy spot in the neighborhood. An early adapter on H to locally sourced ingredients and the presentation is often inventive. Can bring your own wine if you pay a corkage fee. Good cocktails. A pro job. Queen Vic; 1206 H St NE: British pub run by an actual Brit. Very friendly place, with an ambitious menu for a bar, although a couple of previous chefs have left for more food intensive restaurants. Good selection of UK and European beers. Solid choice. Vendetta; 1212 H St NE: Italian/American concept from DC legend Joe Englert, who has brought many quirky bars and restaurants to the District over the last two decades and who I think is one of the city’s unsung heroes. Vendetta has a bocce court, which is pretty cool. I really like the bar here. Englert was or is involved with a half-dozen bars and restaurants in this neighborhood. Sticky Rice; 1224 H St NE: Craving sushi and tater tots? Here’s your place. Sticky Rice has a fun atmosphere and makes creative use of sushi with some presentations you won’t find elsewhere. Good vegetarian options. Now open for lunch – not many H street restaurants are. Menu is good for a laugh: “Godzirra rolls” indeed. Smith Commons; 1245 H St NE: Somewhat less fancy than the Atlas Room but the food’s good if sometimes hit and miss and they make a dynamite Manhattan, bartender taught me to burn an orange peel and toss it in. Beautiful inviting space, roomy second floor back deck for when the weather cooperates. Another place Barack and Michelle have dined. Toki Underground; 1234 H St NE: Best food on the strip, small space, big Taiwanese style Ramen dishes, inventive cocktail menu. The food here is great and a value. Recent rave tweet from Neil Patrick Harris. Doesn’t take reservations, but leave your name and number at the host station and they’ll text you when your table’s ready. Go to one of the many nearby bars to wait. A bit tough to find, it’s up the stairs just left of the entrance to The Pug, the divey bar next door. H Street Country Club; 1335 H Street NE: Bar/restaurant famed for its impressive miniature golf course, which takes players on a tour of reimagined DC monuments and historic sites. Takes about a half-hour to play, 7 bucks. There’s also skeeball and shuffleboard if you can’t get a tee time. Dangerously Delicious Pies; 1339 H St NE: DC branch of a Baltimore favorite, DDP serves sweet and savory pie until 3:30 a.m. Fridays and Saturdays. Not cheap but the pie is good and it’s open late. Granville Moore’s; 1238 H St NE: Another early arrival on the new H, known for its rustic charm, Belgian beer and mussels. Which are good enough to lure in Bobby Flay for his Food Network “Throwdown” series. They won. Star & Shamrock; 1341 H St NE: Charming Irish pub/Jewish deli hybrid serves good sandwiches – get the pastrami — and is also open at lunch. 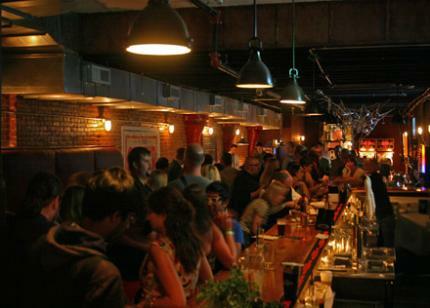 It’s big, U-shaped bar offers a lot of seats, not always true of other DC bars. 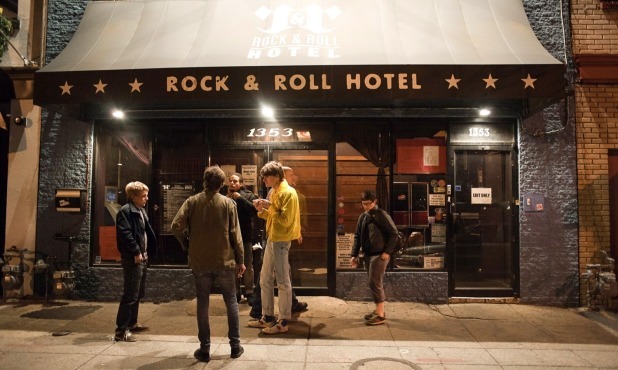 Rock and Roll Hotel; 1353 H St NE: Leading music venue on H Street gets a wild mix of up and coming acts in its first floor performance space. Second floor bar is cool, with guitars dangling from the ceiling and some semi-private spaces toward the back that have that old New Orleans bordello feel. Huge roof deck, but winter weather may moot that. Drinks tend toward shot-and-a-Schlitz. Building was once a mortuary and part of second floor is reportedly haunted. As the website notes, it’s not an actual hotel. Biergarten Haus; 1355 H St NE: Very popular Bavarian-themed bar with a big beer garden out back, but in winter the large enclosed, heated back patio bar has its charms as well. The place keeps it simple, German beer and sausage predominate. A favorite among soccer fans. Argonaut; 1433 H St NE: Another Englert spot, the Argonaut was THE pioneer in the H Street revival and still a favorite neighborhood spot. Decent food, good prices, nice vibe. This entry was posted in Chicago Blackhawks, Washington Capitals, Winter Classic 2015 and tagged boozy loiterers, Dave Eskola, entertainment guide, H Street. Bookmark the permalink.